The Eastern Caribbean is one of the most versatile, interesting, and affordable cruise destinations. Numerous Royal Caribbean cruise ships travel through the Eastern Caribbean and the Oasis of the Seas is one of the most popular. Watch out for discount Royal Caribbean Cruises that offer luxury cruising at a lower price or a shorter time period to reduce costs. The Eastern Caribbean is a great destination for such a shorter cruise. Cruising the Eastern Caribbean is convenient because ships leave from various U.S. ports including Miami and Ft. Lauderdale, as well as a variety of points along the east coast as far north as New York. There are also points of departure throughout Europe. Eastern Caribbean cruises typically include Puerto Rico, the American and British Virgin Islands, St. Maarten/St. Martin, and sometimes even the Bahamas although they lie outside of the traditional Caribbean range. You don't want to miss out on the Royal Caribbean cruises shore excursions! Offered activities range from watersports, tours of historic buildings, landmarks and neighborhoods to duty-free shopping trips. Island hoppers are also encouraged to visit the unique shops and dining options during their port visits. The best time to cruise the Eastern Caribbean is December through April, but some cruise lines offer warm weather cruises during months that are less popular. The Oasis of the Seas is currently part of the RCCL cruise line and sails the Eastern Caribbean. The ship is fairly new, having only begun booking trips in fall of 2008. The ship is enormous and plays host to large groups of cruisers, but there is enough space for people to travel in comfort. The Opus Dining Room features three floors and assigns passengers to tables where they will enjoy the convenience and service of a consistent wait staff throughout their trip. Other options for dining on the ship include the Solarium Bistro, the Windjammer Buffet, Chops Grill, The WipeOut, and the Mondo Coffee Bar. Experienced cruisers who give a Royal Caribbean Cruise review report that the state rooms of the Oasis of the Seas are rather nice. 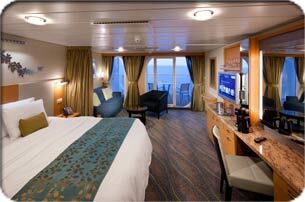 The ship is clean and rooms are stocked with amenities. For guest safety, bathroom mirrors are illuminated at night to help you find your way to the facilities, even when you are half asleep. Activities onboard the Oasis of the Seas include Broadway style shows, an ice dance show, an Aquatheater, comedy performances, and kid clubs and activities. The Aquatheater area features a zip line where cruisers can zip 80 feet above other passengers for a thrilling adventure. While the experienced cruiser may yearn for more exotic ports or a less commercialized ship, first time cruisers and folks in search of a relaxing, all-around fun time will love cruising the Eastern Caribbean on the Oasis of the Seas. Always wanted to see the "Adventure of the Seas", one of the majestic Royal Caribbean Cruise Ships?